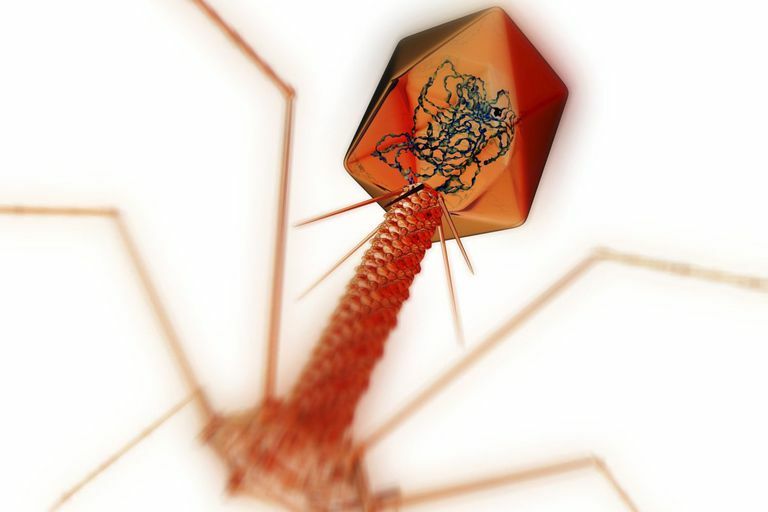 This is a T4 bacteriophage virus. The structure at top is the head, which contains DNA inside a protein coat. Attached to this is the tail, consisting of a tube-like sheath and tail fibres (at bottom). The virus attaches itself to the host bacteria cell wall by its tail fibres; the sheath then contracts, injecting the contents of the head (DNA) into the host. Bacteriophages are "bacteria eaters" in that they are viruses that infect and destroy bacteria. Sometimes called phages, these microscopic organisms are ubiquitous in nature. In addition to infecting bacteria, bacteriophages also infect other microscopic prokaryotes known as archaea. This infection is specific to a specific species of bacteria or archaea. A phage that infects E. coli for instance, will not infect anthrax bacteria. Since bacteriophages do not infect human cells, they have been used in medical therapies to treat bacterial diseases. Bacteriophages have three main structure types. a filamentous or rod-shaped capsid with circular single-stranded DNA. How do viruses fit their voluminous genetic material into their capsids? RNA bacteriophages, plant viruses, and animal viruses have a self-folding mechanism that enables the viral genome to fit within the capsid container. It appears that only viral RNA genome have this self-folding mechanism. DNA viruses fit their genome into the capsid with the help of special enzymes known as packing enzymes. Bacteriophages are capable of reproducing by either the lysogenic or lytic life cycles. The lysogenic cycle is also known as the temperate cycle because the host is not killed. The virus injects its genes into the bacterium and the viral genes are inserted into the bacterial chromosome. In the bacteriophage lytic cycle, the virus replicates within the host. The host is killed when the newly replicated viruses break open or lyse the host cell and are released. Bacteriophages help to transfer genes between bacteria by means of genetic recombination. This type of gene transfer is known as transduction. Transduction can be accomplished through either the lytic or lysogenic cycle. In the lytic cycle, for example, the phage injects its DNA into a bacterium and enzymes separate the bacterial DNA into pieces. The phage genes direct the bacterium to produce more viral genes and viral components (capsids, tail, etc.). As the new viruses begin to assemble, bacterial DNA may inadvertently become enclosed within a viral capsid. In this case, the phage possesses bacterial DNA instead of viral DNA. When this phage infects another bacterium, it injects the DNA from the previous bacterium into the host cell. The donor bacterial DNA then may become inserted into the genome of the newly infected bacterium by recombination. As a result, the genes from one bacterium are transferred to another. Bacteriophages play a role in human disease by turning some harmless bacteria into agents of disease. Some bacteria species including E. coli, Streptococcus pyogenes (causes flesh-eating disease), Vibrio cholerae (causes cholera), and Shigella (causes dysentery) become harmful when genes that produce toxic substances are transferred to them via bacteriophages. These bacteria are then able to infect humans and cause food poisoning and other deadly diseases. Scientists have isolated bacteriophages that destroy the superbug Clostridium difficile (C. diff). C. diff typically affects the digestive system causing diarrhea and colitis. Treating this type of infection with bacteriophages provides a way to preserve the good gut bacteria while destroying only the C. diff germs. Bacteriophages are seen as a good alternative to antibiotics. Due to antibiotic overuse, resistant strains of bacteria are becoming more common. Bacteriophages are also being used to destroy other superbugs including drug-resistant E. coli and MRSA. Bacteriophages are the most abundant virus in the ocean. Phages known as Pelagiphages infect and destroy SAR11 bacteria. These bacteria convert dissolved carbon molecules into carbon dioxide and influence the amount of available atmospheric carbon. Pelagiphages play an important role in the carbon cycle by destroying SAR11 bacteria, which proliferate at a high rate and are very good at adapting to avoid infection. Pelagiphages keep SAR11 bacteria numbers in check, ensuring that there is not an overabundance of global carbon dioxide production. Encyclopædia Britannica Online, s. v. "bacteriophage", accessed October 07, 2015, http://www.britannica.com/science/bacteriophage. Norwegian School of Veterinary Science. "Viruses Can Turn Harmless E. Coli Dangerous." ScienceDaily. ScienceDaily, 22 April 2009. www.sciencedaily.com/releases/2009/04/090417195827.htm. University of Leicester. "Bacteria-eating viruses 'magic bullets in the war on superbugs'." ScienceDaily. ScienceDaily, 16 October 2013. www.sciencedaily.com/releases/2013/10/131016212558.htm. Oregon State University. "A war without end, with Earth's carbon cycle held in the balance." ScienceDaily. ScienceDaily, 13 February 2013. www.sciencedaily.com/releases/2013/02/130213132323.htm.